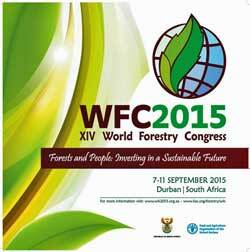 The need for governments, civil society and the private sector to boost investment in forests as a key element for sustainable development will be the focus of the XIV World Forestry Congress taking place in Durban, South Africa, from 7 to 11 September 2015. Under the theme Forests and People: Investing in a Sustainable Future, participants will discuss ways to unleash the full potential of forests to lift rural populations out of poverty, act as buffers against climate change and inspire new technologies and renewable products. Around 20 ministers and deputy ministers from around the world will join heads of international and national agencies and several thousand delegates gathering for the Congress, which takes place every six years. This year’s event is hosted by the Republic of South Africa with support from FAO, and marks the first time the Congress will be held on African soil since its inception in 1926. Main Congress proceedings will be in English, French and Spanish and will be webcast. Jacob Zuma, President of the Republic of South Africa, Prince Laurent of Belgium, Special Ambassador to FAO for Forests and the Environment, and Nkosazana Dlamini-Zuma, Chairperson of the African Union Commission, are among speakers who will open the Congress. At the opening ceremony, FAO Director-General José Graziano da Silva will launch FAO’s latest Global Forest Resources Assessment, which reveals how the world’s forests have changed over the last 25 years and provides the latest information on the state of sustainable forest management. Following a VIP tree-planting ceremony, a press conference will take place at the ICC foyer starting at 11:10 GMT(+2). Around 20 ministers and deputy ministers will take part in a high-level dialogue on the global forest agenda to explore how investments in forests, forestry and forest communities can best contribute to implementing the Sustainable Development Goals (SDGs). Representatives from the African Union, the South African Government and FAO will join scientists and researchers to focus on the role of forests in regional and national efforts in adapting to, and mitigating, climate change. Worldwide, more than one in six people still do not have access to safe drinking water. As global demand for fresh water rises and water grows scarcer, the Five-year Forests and Water Action Plan will call for action in areas of science, policy, economics and forest practices. The TREEHOUSING competition challenged professional architects, students and designers to develop innovative and sustainable wood housing and urban building solutions. Canadian architect Michael Green, author of The Case for Tall Wood Buildings, will announce the winners. The winner of the Wangari Maathai Forest Champions Award 2015 will be announced at a special ceremony. The USD 20,000 prize was established by the Collaborative Partnership on Forests in 2012 and recognizes extraordinary efforts by an individual to improve and sustain forests and the people who depend on them. The Congress outcome, Vision 2050, is set to strengthen the role of forests and forestry in sustainable development and pave the road to a new climate change agreement at the UNFCCC COP21 in Paris in December.